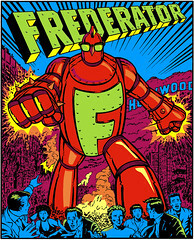 The Frederator Studios Blog: Jazzbos, Bluesmen & Mexico. Postcards, Series 5. We've had so much news lately, I've lost track of our latest postcard mailings. As you know, each one of our limited edition postcards goes to 200 folks on our mailing list.